Follow Roger Ebert, Win Me A Cheesecake! Okay. At this point, I’m really starting to worry that Roger Ebert isn’t going to have 100,000 Twitter followers by the end of the year. In early October, I was serenely confident that Twitterer #79,797,834 would have more Followers than I by Halloween. I was just as certain that he’d break 100,000 by January 1. I mean, come on. Ashton Kutcher and Britney Spears each have about 160 as many followers as Ebert. Have they won Pulitzers? If they have, and they declined to accept them, then admittedly that shows a laudable commitment to the creation of art as opposed to the pursuit of glory and maybe they do deserve to sit at the top of the Twitter tree. I’m inclined to doubt it, though. Roger Ebert is the Samuel Johnson of our age. Captain of thought, wielder of the sharpest eye and keenest wit, observer of all, sage and insightful commentator on much, sitting in arrogant judgment of nothing and nobody. It kills me that he doesn’t even have as many followers as Mary-Kate Olsen (87,493). This ain’t right, people. Pamela Anderson (aka the Ghost of Olsen Twin Future) has 94,643. If you’re somehow OK with her having more Followers than Roger Ebert, you should further know that Karl Rove has 95,154. I’m certain that Roger doesn’t care that Rove has more followers. Roger Ebert is one of those finer specimens of Humanity. But if Roger gets to 100,000 before Rove does, I’m equally certain that Rove’s big round pink melon will redden with fury and then pop like a balloon, causing the man to disappear behind a snowstorm of shredded 2000 Florida ballots. Do you really need another reason to pitch in and encourage people to follow Roger? And of course, there’s also the fact that Roger has the one of the highest signal-to-noise ratios on Twitter. There have been days when I retweeted so many of his links and comments that I considered just handing Roger my Twitter password for the next ten hours or something. If Roger Ebert has 100,000 Followers or more by January 1, I win a free cheesecake. Seriously. 100,000 Followers for Ebert = free cheesecake for Ihnatko. Not one of those Mrs. Dainty models from your grocer’s freezer, either: I’m talking the kind of profound cheesecakes that could kill you if you ate the whole thing and grievously injure you if it fell on top of you. Yes, there’s a wager involved. I kind of shot off my mouth when Ebert first joined Twitter. I was certain that in no time at all, his account would get BoingBoinged and Farked and Metafiltered. Maybe one of our society’s more useful celebrities would mention Roger’s Twitter potency during an appearance on Letterman. Hell! Oprah herself would definitely push Roger Ebert’s Twitter account over the 500,000 mark. One day, she’d start her show with a sequence of electronic pips that causes the core software of her viewers to go into Command Acquisition mode. “Join Twitter,” she would then say, not breaking eye contact with the camera lens. “Follow Roger Ebert. Await further instructions.” And then a second sequence of tones would close the channel and she’d welcome the cast of “It’s Complicated” onto the sofa. Either way, People Would Follow Him. How could the Twitter community fail to put Roger into the top 500? The fuse was lit; the rocket would lance into the heavens. Thus the wager: in a turn of events eerily similar to the ones which sent Phileas Fogg around the world for 80 days, if either of these predictions are met, I will win a free cheesecake. I remind all of you that I am a print journalist in a rapidly collapsing market. Further, the winter of 2009-2010 promises to be one of the coldest on record. 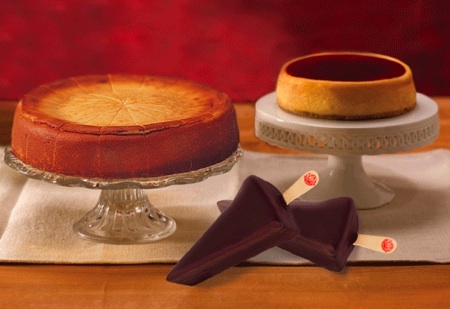 A free, premium cheesecake will provide me with the fats and calories I’ll need in order to generate and conserve precious body heat and survive into the Spring. None of this doing it for you? Let’s try a new tack, then: if Roger Ebert hits 100,000 Followers by January 1, I will write, record, and post an entire audiobook in a 24-hour period. No joke. I’ll do it. We will choose a day in January. I will write the whole thing from start to finish on Ustream or something so you can see I’m not just digging out an unpublished manuscript from existing inventory and spending the rest of the day eating cheesecake and having a good laugh at your expense. I will write the story, I will record it, and I will post it, all within a 24-hour span of time. I mean, it’s OK by me. I have a whole day I can devote to writing and recording. What I don’t have is a huge, premium cheesecake or the financial means with which to purchase one. I’d much rather have the cheesecake than the 24 hours. I had hoped to simply allow things to run their natural course, but as I said, there’s now just a week left in the year and it’s entirely possible that Roger won’t get the necessary 10,000 new Followers per day. Any way you slice it — mmm, sliced cheesecake — sorry, any way you slice it, it’s completely in your best interests to Follow Roger Ebert, and to encourage 70,000 of your friends to do the same. Follow Ebert today, Cheesecake and Storytime tomorrow. Revolutions have been founded, fought and won on flimsier slogans. Onward to glory! Can I just buy you a cheesecake? Ebert’s tweets just aren’t that interesting. Count me in with Gregory Harbin’s sentiments. The way you and LaPorte go on and on about Ebert’s post, I tried following him for two days. Nothing of great value posted, and frankly, the same silly tripe stuff the rest of tend to post when bored. Maybe I just picked a bad two days to sample him? Well, sirs, it hurts me that you don’t see the genius of the planet’s most beloved movie critic and commentator-at-large. I can even forgive the fact that you two hate America. But what do you have against cheesecake, sirs? No, no. I am forced to dismiss these comments as the rantings of men who spend most of their days writing angry letters to the Daily News about the postal service’s failure to honor pro bowlers with their own commemorative stamp. Since everyone everywhere on their blogs, in their tweets, in their Christmas cards, on their cars, t-shirts, hats, anywhere and everywhere possible puts their political opinion in such a form that it is guaranteed to either irritate, anger or cause an eye-roll to 40% of the population, can’t you rise above that and simply leave that topic alone? There is a way to do political humor that is not smug, condescending or presumptive. It’s hard. There is a cheap, sneering way to do it that relies on “preaching to the choir”. It’s easy. But we aren’t all in the same choir. I know this is your blog, and it is unreasonable for me to ask you to change *anything* about it, but how about considering it anyway? You had a post about how awesome Ebert’s Twitter posts are, and how you want him to have more success, and how awesome cheesecake is and how you want your stomach to have more to digest (almost got a rhyme there) and then you went political and spoiled the fun for some of us reading. It is especially bad when this stuff crops up in Macbreak Weekly Podcast. I have friends that I *share* political views with who know better than to start in with that sort of humor around me. Ethnic jokes can be hilarious. Ethnic jokes predicated upon a genuine hatred for the target ethnicity are not funny. Same goes for politics. Alec Baldwin’s character in 30 Rock is one of my favorites, and all of the political stuff in that show is pure gold, and it is almost uniformly targeting conservatives/conservatism. Anyway, I get bombarded with this sort of humor in movie reviews, sports columns, blogs, in line waiting for coffee, etc. Sir! How dare you accuse me of harboring any negativity in regards to cheesecake? Did I not specifically state that I would gladly follow Ebert if you sent me a cheesecake for doing it? I’d settle for just a slice of yours, actually. Deal? I’ll follow Gene Siskel before I’d follow Ebert. But chocolate covered cheesecake on a stick I’ll follow anywhere. Maybe someone should buy a cheesecake for the guy holding the gun to romzburg’s head and forcing him to read this blog. Helping a man win a cheesecake is one of the noblest causes one can engage in. I personally feel that helping Mr. Ihnatko win a cheesecake is the work of the Divine. The Karma one can receive from such an action is immeasurable. In an unprecedented coincidence, I just started following Roger Ebert’s tweets a few days ago…and now today I learn that, unbeknownst to me, my follow was helping you win a cheesecake! Holy mackerel! The universe is working in your favor! I definitely recommend Ebert’s tweets, which include the inane (as many of ours do) as well as insightful cinematic critiques and thought-provoking articles. I already follow Ebert. He sure does tweet a lot! Also recommend Richard Roeper as well, who can be pretty funny and is also a good critic. You will have much better success if you promise to give the cheesecake to one of his followers. This will encourage new people to join. You, like me, look like you don’t need the cheesecake as badly as others. I can’t help you win the cheesecake since I already follow Roger – since the days of the Showbiz Media forum – but here’s what I can do if I can have a slice of the cheesecake. I’ll drop out as a follower of Karl Rover (please don’t ask why I follow him) and then Roger’s chances increase. I know, the logic is somewhat faulty but I got a bottle of single malt for Christmas. What can I say? I’m willing to help! I feel that Andy Ihnatko is deserving of a free cheesecake. I bless and endorse this endeavor, even though I’m not on twitter, for very good reasons which I can’t quite remember at the moment, but they’re good reasons. I keep Roger’s Twitter alone, up on my browser 24 hours a day; I frequently wake out of deep dreams and a sound sleep to check it. Recently I woke myself out of a powerful dream of meeting Jesus Christ to check Roger’s latest tweet. I feel that each supporter of Andy’s free cheesecake and Roger’s Twitters must send this message to at least ten of their friends and local news stations. I feel that if they don’t do this within 24 hours they will suffer bad luck for the next 16 months, and possible ambushes by Jehovah’s Witnesses. Remember: the nicer they seem, the longer you will let them sit in your living room. I already follow and enjoy Roger Ebert and wish I could follow him more time to help your cheesecake cause. You did not specify where the cheesecake will come from and that may sway some on the fence, although the picture you posted is quite impressive. Those of us on the west coast can only look on longingly since true NY style cheesecake dies not exist here. Good lord I wish I could fix my typos from my previous post! However now that I’m caught up with reading Twitter and see that the cheesecake comes from Eli’s, I have the difficult decision as to whether to spend $63 to try one myself. I hope Andy can advise. Maybe someone can help Jenn to read with comprehension. So…don’t leave us in suspense. Did you win the cheesecake, or not? I’m too lazy to go to twitter and find out for myself.